Training Room Tables, Workstations, Mailroom, Conference Tables, Podiums, Lecterns, and much more! 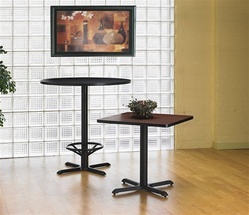 This impressive variety of dining table shapes, sizes and colors will enhance any break room or lunchroom. This impressive variety of training table shapes, sizes and colors will enhance any office decor. Choose from many laminate and wood veneer tables. Timeless Collections from leading manufacturers. The impressive variety of training table available in many different shapes, sizes and colors at Ofconcepts will enhance and improve any office and will accompany any décor and style of business office furniture. Multiple lines of meeting room tables are available in the list of affordable business furniture that allows any company to train incoming employees in comfort. 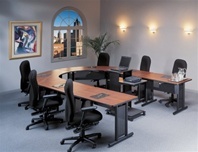 With the multiple selections of meeting room tables available at prices that beat business furniture outlet stores. With the best office furnishing in your meeting rooms, you will be setting not only the first impression but gaining furniture that lasts. Spacious, comfortable and beautiful conference tables set the tone not only for internal meetings but also for face to face with prospective new employees, other companies and clients. At Ofconcepts you are able to choose from many laminate and wood veneer conference tables that ranges from luxurious, rick and traditional look to the crisp, stark lines of contemporary office furnishings. Exquisite and distinct conference table lines are available on Ofconcepts will make the new addition to your office the center of attention and the talk of the office. The timeless collections from leading manufacturers are available at Ofconcepts for sale. Ofconcepts is the place to buy office furniture including occasional tables that are used for different functions around the office. With one of the most affordable office furniture suppliers in the country, Ofconcepts providing occasional tables for the multiple different functions that your office might hold throughout the year. The portable, movable and light occasional tables can serve multiple roles in very quick successions in your office instead of being tucked away in a corner. Occasional tables can become a great corner piece alongside reception area furniture next to the ergonomic seating for your guest. Occasional tables are only limited by their use only by your imagination. However much times and technologies will change some duties and functions will not, traditional furniture when necessary for a specific duty can still be found at Ofconcepts and is also still available in a wide range of styles and configurations for your specific office needs. Ofconcepts carries drafting tables that can combine with your drafting chairs to maximize not only your productivity by having a space specifically designed for your set duties. Having drafting tables to complete your projects increases the efficiency of your office.